Fountain boats are some of the best speedboats on the water. Buy your very own Fountain style remote control boat and have even more fun. This RC Boat runs in saltwater or freshwater, just run freshwater through the intakes after playing in the bay or ocean. Great remote control boat for the pool, river, and pond too. Reach speeds of about 35 mph with its powerful brushless racing motor, rechargeable battery pack, and charger. Easy for all ages to use and beginners to experts will love the control thanks to the functional steering rudder just like on a full size boat. Looking for another special feature? 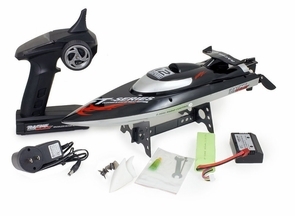 Your new RC boat will automatically flip back on it's correct side by itself even if you are jumping really big waves! Measures 1 /12 feet long and comes fully assembled and ready to play with. Drive forwards, backwards, left, and right. Fountain boat lovers of all ages which get a kick of how real this RC speedboat looks. You will really like this fun remote control boat. Long range 2.4 ghz remote control of about 800-1000 feet. Want more? Buy this RC boat right now and will include an extra set of propellers. Yes, we also carry all spare parts just in case. A boat with all of these features and accessories in a hobby store would cost over 400 dollars! Order more than 1 remote control boat today and we will send separate operating frequencies for the remote controls for exciting boat racing action. Shopping for a different style or model of radio control boat or toy? Have fun with the full line of remote control boats and pool toys. Great boat. Fast and fun. We got two w/different freq and race each other around on a 5 acre pond. This boat goes at a good speed and has held up over a couple seasons now. We've had no real issues. I'd buy them again. They are a lot of fun. Radio has good range. Young teens and dads can have a lot of fun with this boat. Get two.